Watertown Officer Michael VanWaldick's police department is being sued by Ryan Dorr, the man VanWaldick shot several times in the chest last December as VanWaldick kidnapped his girlfriend, Jessica Quinta at gunpoint from an apartment. Jessica had been his girlfriend for six years and had recently broken up with him. Between late summer and October 2, 2003, VanWaldick allegedly restrained Quinta by confining her at her residence and used force to stop her from leaving. On October 3, 2003, VanWaldick allegedly abducted Quinta from a parking lot on Newell Street, forced her into a car and took her to at least one location where it was unlikely she'd be found. (Quinta once worked at the now-closed Red Lion restaurant on Newell Street). Between December 4 and December 8, 2004,VanWaldick allegedly followed Quinta and placed several phone calls to her. VanWaldick allegedly threatened Quinta by threatening to kill himself or her. VanWaldick allegedly went to Applebee's Restaurant where Quinta worked on December 5, 2004 and threatened to kill her if she did not go with him. He took her keys to stop Quinta from using her car. Was he ever disciplined by the police department prior to his arrest on attempted murder and kidnapping charges? Was there ever a formal investigation into alleged prior incidents? Were criminal complaints ever filed against him? Now Dorr has taken the next step in legal action against the City of Watertown by filing a lawsuit against its police department. Retaining VanWaldick despite knowing his posed a danger to himself and others. VanWaldick is currently awaiting sentencing after pleading guilty to the shooting. ..."The City of Watertown in this case has made no attempt to resolve this matter so it leaves us with no choice but to go to the next step which is to file a lawsuit..."
NEW YORK - Watertown Officer Michael VanWaldick's police department is being sued by Ryan Dorr, the man VanWaldick shot several times in the chest last December as VanWaldick kidnapped his girlfriend, Jessica Quinta at gunpoint from an apartment. Jessica had been his girlfriend for six years and had recently broken up with him. -- Between late summer and October 2, 2003, VanWaldick allegedly restrained Quinta by confining her at her residence and used force to stop her from leaving. -- On October 3, 2003, VanWaldick allegedly abducted Quinta from a parking lot on Newell Street, forced her into a car and took her to at least one location where it was unlikely she'd be found. (Quinta once worked at the now-closed Red Lion restaurant on Newell Street). 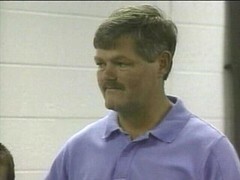 -- Between December 4 and December 8, 2004,VanWaldick allegedly followed Quinta and placed several phone calls to her. VanWaldick allegedly threatened Quinta by threatening to kill himself or her. -- VanWaldick allegedly went to Applebee's Restaurant where Quinta worked on December 5, 2004 and threatened to kill her if she did not go with him. He took her keys to stop Quinta from using her car. -- Was he ever disciplined by the police department prior to his arrest on attempted murder and kidnapping charges? -- Was there ever a formal investigation into alleged prior incidents? -- Were criminal complaints ever filed against him? Now Dorr has taken the next step in legal action against the City of Watertown by filing a lawsuit against its police department. Earlier, Dorr filed a notice of claim against the city, alleging that its negligence led to his severe shooting injuries. -- Retaining VanWaldick despite knowing his posed a danger to himself and others.